What Happens During a Remote Healing? What if you didn’t believe in God and miracles started to occur? Shaman Stone Soup takes you on the journey of an atheist who discovers Native American spirituality and becomes a healer for friends, family and clients. The author shares her personal stories that demonstrate how spirit guides, angels and enlightened beings can answer calls for help through miracles. You will read about the matronly ghost who overstayed her welcome, the spirits of ancient wise men who offered advice and a miraculous cure from cancer for a friend, the man who got out of his wheelchair to go hunting and fishing, a vivid dream and later chance meeting of a pastor who needed guidance, the metamorphosis of a schizophrenic, the loving afterlife contact from her mother who died unexpectedly, and many other stories. “Take this journey into the world of the Shaman and the miraculous power of love.” — LOUIS LaGRAND, Ph.D.
Shaman Elizabeth Herrera is a shamanic healer, activist and author of life-changing books. Her stories encourage people to stretch outside their comfort zones and reexamine their own beliefs. She inherited her rebellious spirit from her father who was raised by his grandfather — a full-blooded Apache who smuggled sugar and flour from Mexico into Texas, exchanged gunfire with Texas Rangers and crossed paths with Pancho Villa. Elizabeth was raised in a Christian home, but lost her faith in her early twenties. For over a decade, she searched for something to fill the void, eventually discovering Native American spirituality (shamanism). Through this spiritual practice, she unexpectedly became a catalyst for healing and miracles. These events led her back to a belief in a higher power. Always drawn to the spiritual side of life, Elizabeth began her shamanic path in Michigan where she learned to shamanic journey with Stephanie Tighe (a certified Sandra Ingerman instructor). 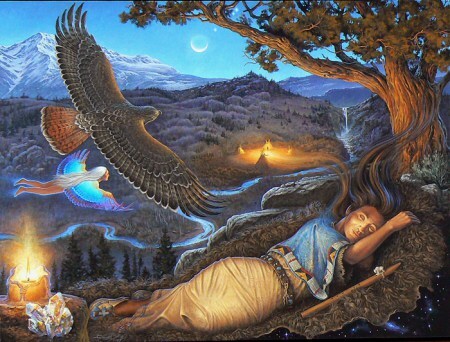 Elizabeth continued her studies through the Foundation for Shamanic Studies for shamanic journeying, soul retrieval, and death and dying (psychopomp), but her major source of learning has been from her spirit guides, who offer limitless guidance and lessons on living a more spiritual life. She is the author of the books Shaman Stone Soup, Earth Sentinels: The Storm Creators, Of Stars and Clay and Dreams of Heaven. To keep abreast of her latest books, please visit her website at ElizabethMHerrera.com. To join the email list, click here.